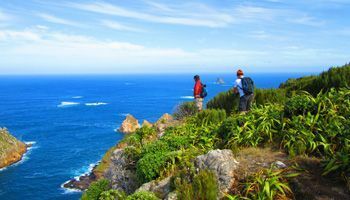 If you are contemplating visiting the Chatham Islands, Pitt Island is a must see. 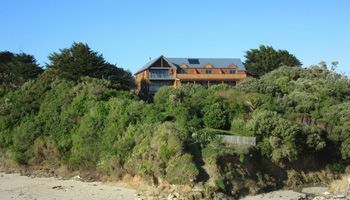 Flowerpot Bay Lodge offers beach front accommodation on Pitt Island for Couples, Families and Groups. Pitt Island is the second main inhabited Island in the Chatham Islands group, arguably one of the most remote holiday destinations in the world. Pitt Island is the first place in the world to see the sun rise each day and has some of the region’s most spectacular scenery, bird life, botany, geology, fishing, diving and hunting experiences. The Island provides a friendly atmosphere and a range of attractions to suit any visitor, especially nature lovers. The 2.3 Ha property owned by Bernadette & Brent Mallinson is located just 75 metres from the beach and main wharf with commanding views above Flowerpot Bay. The lodge, finished in Colonial style in keeping with the historic nature of the site, is purposefully designed to provide a warm home-like atmosphere with the ambiance of a country retreat. 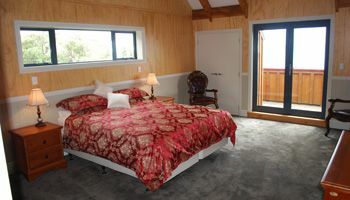 Whether you want a full-on action packed adventure or a relaxed make-it-up as you go holiday, your stay at Flowerpot Bay Lodge will be the highlight of your Chatham Islands experience. We work closely with the main Island accommodation providers so why not spend a few days on both Islands. Choose from our range of personalised walking, boat and luxury 4x4 Tours. Let us do the organising for you so that you can just relax, indulge your passion and enjoy life - the way it used to be. Flowerpot Bay Lodge is perfectly situated to offer commanding views above its namesake on Pitt Island. Full range of nature based activities. Home to some of the world's rarest birds and plants. New Zealand's most remote lodge - 25 minutes from main Chatham Island.